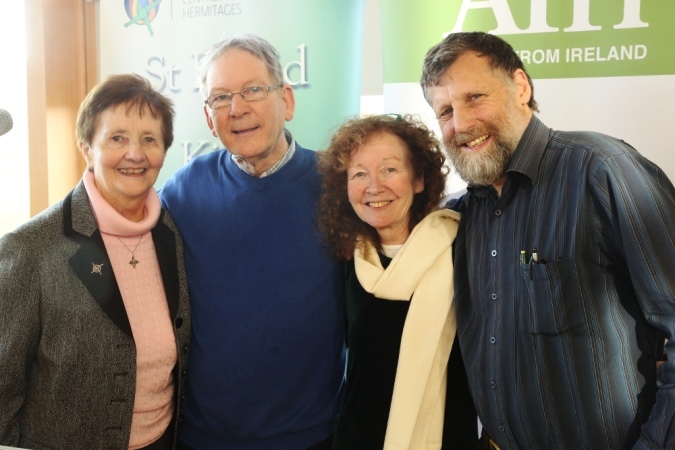 Afri’s 2018 Féile Bríde took place on Saturday 3rd February in Solas Bhríde in Kildare town. 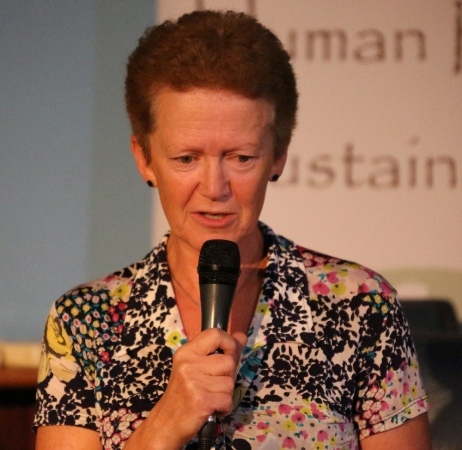 It was a rich and full day with contributions from Peadar Kirby about caring for our global village, Hanny Van Geel (Via Campesina), Rose Hogan (Trócaire) on ‘food for life’, John Maguire on ‘Peace Meal Change’ and wrongfully imprisoned Sunny Jacobs and Peter Pringle, as well as music and poetry. You can get a flavour of the day in a short film made by RoJ. This is the twenty-sixth year of another well-attended Afri conference hosted at Solas Bhríde Centre, Kildare. As visiting speaker, Peadar Kirby named it, the Ard fheis of Afri. Some 200 people attended in the beautiful setting of the Centre & Hermitages, a centre of hospitality, brightness radiating a warm welcome. Brigidines – Mary, Phil and Rita – organise and manage the Centre with Cairde Bhríde, faithful friends and staff. 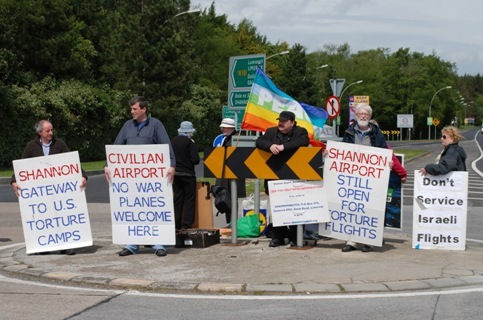 On the 25th May 2016 peace activists and Afri friends, Dave Donnellan and Colm Roddy, entered Shannon airport to inspect illegal U.S. military war planes stationed there. The three security authorities of the Gardaí, Army and airport police all refused to search the planes for weapons in gross dereliction of their duty to protect innocent civilians. Dave and Colm were arrested and charged with criminal damage without lawful excuse. See article about the action here. Afri strongly endorses Shannonwatch’s condemnation of the arrest of Deputies Mick Wallace and Clare Daly as a result of their action to inspect war planes passing through Shannon. It is extraordinary that perpetrators of war and destruction can parade through Shannon unhindered while those who are opposed to war are arrested, demonised and imprisoned. The actions of Mick Wallace and Clare Daly should be a wake-up call to the Irish Government to reverse the shredding of the last remnants of our neutrality and end the use of Shannon for war and destruction. A protest at Shannon Airport took place on March 15th to mark the 12th Anniversary of the 2nd US-led war on Iraq and the Taoiseach’s annual cap-doffing, forelock-tugging exercise before the Commander-in-Chief of continuing wars in Afghanistan and around the world, wars in which Shannon plays a crucial role. It was preceded by a ‘cycle of nonviolence’ from Dirty Nellies at Bunratty Castle to Shannon Airport. Organised by Afri and supported by PANA. “I feel it is my duty as an Irish artist to follow the example of Margaretta D’Arcy and make a stand against the shocking situation of Shannon’s continuing use as an instrument of war. 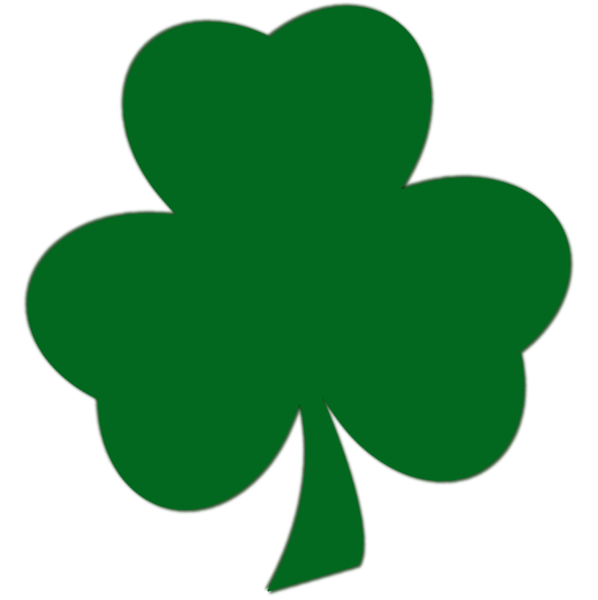 As St. Patrick’s Day looms I want to help focus attention on the fact that the shamrock is stained with the blood of hundreds of thousands of lives taken by the U.S military campaign, of which Shannon is an essential component. Is this the kind of Ireland we want to celebrate? 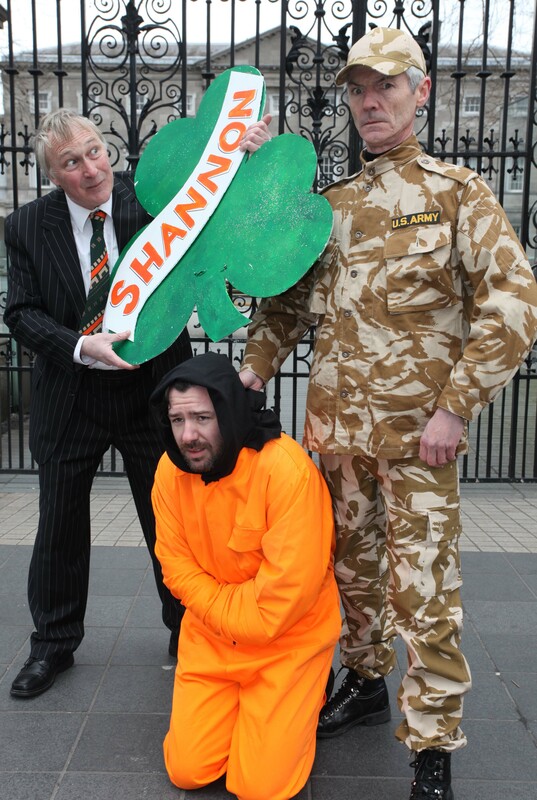 The sight of Irish politicians celebrating St. Patrick’s Day in the U.S is grotesque while human rights abuses and death continue to be facilitated by the Irish government’s gift of Shannon airport to the U.S war machine. I hope my actions can in some way draw attention to the shameful complicity of the Irish government in mass murder”. “At this time of year when a bowl of shamrock is handed over in the White House as a symbol of the gombeen attitude of our leaders, it’s vital to challenge the hypocrisy of the neutral Irish state letting its second airport be used as a warport by the US. How many rendition kidnap flights flew through Shannon with prisoners now in Guantanamo for more than a decade without trial, many force-fed for months? We’ll never know because military flights were not and are not inspected. I feel compelled to use whatever artistic skills I might have to challenge glib acceptance of the use of Shannon by the US army, as a gesture of solidarity with those far-off communities suffering attack by US armed forces with the complicit aid of Shannon Airport. Not in my name, not with my compliance”. – Donal O’Kelly, writer, actor and director. Shamrock, Shame and Shannon: Reclaiming Ireland’s Pride – A protest at Shannon Airport at 12 noon to 1pm on Sunday, March 15th. To mark the 12th Anniversary of the 2nd US-led war on Iraq and the Taoiseach’s annual cap-doffing, forelock-tugging exercise before the Commander-in-Chief of continuing wars in Afghanistan and around the world, wars in which Shannon plays a crucial role. Preceded by a ‘cycle of nonviolence’ from Dirty Nellies at Bunratty Castle to Shannon Airport, starting at 11.00 am. Afri has consistently opposed the abandonment by successive government of Ireland’s policy of neutrality, a policy whereby Ireland pursued largely non-militaristic foreign policy and refused to participate in wars of aggression. All that has now changed, against the will of the Irish people and governments cravenly provide Shannon Airport to the US for its never-ending ‘war on terrorism’ as well as surrendering our neutrality in many other ways. Afri recently launched a petition opposing the use of Shannon as a war-port, which is on-going and our Board member John Maguire has devised this campaign called ‘PETALS’ (Peaceful Endeavour to Terminate Aggressive Landings at Shannon) as a way of drawing attention to our continual participation in wreaking death and destruction on other peoples and nations. John was prevented from handing these peace shamrocks to passengers in Shannon Airport this weekend. 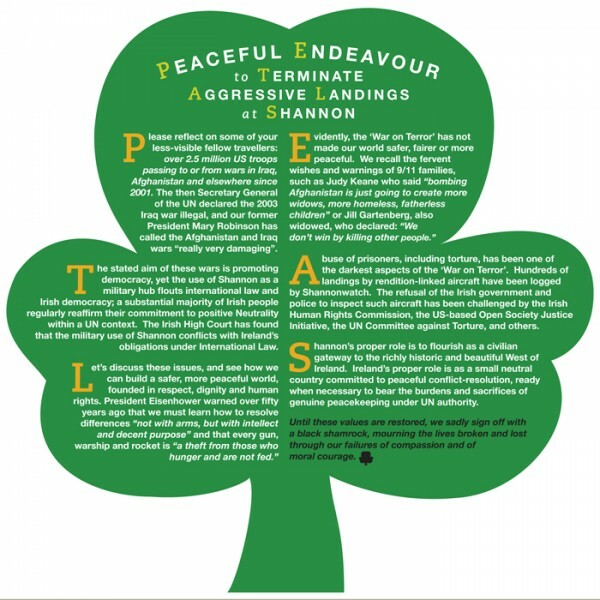 Apparently war planes and rendition flights are acceptable in Shannon but not shamrocks! To sign our petition to show that you oppose the military use of Shannon airport go here. Shannonwatch welcomes the visit to Shannon Airport by the Oireachtas Joint Committee on Public Service Oversight and Petitions. The visit which took place on October 2nd was a follow-up to a petition by Shannonwatch earlier this year. The petition called for the Government to investigate the use of Shannon Airport and Irish airspace for the transit of US armed troops, munitions and other war material, as well as for the refuelling of CIA-associated aircraft involved in extraordinary rendition. During their visit to Shannon, representatives of the Committee met with members of the Gardai including Chief Superintendent John Kerin and with airport officials before meeting again with Shannonwatch. They were informed that about 40,000 US troops had gone through Shannon so far this year. However Shannonwatch understands that airport officials said that US troops were not essential to the economics of Shannon Airport as they contribute relatively little, and that civilian passengers contribute far more with shopping, car parking and so on. Amongst the topics covered in a constructive meeting between Shannonwatch representative Edward Horgan and the Committee were the non-searching of US military aircraft, and past indications from Gardai that the Attorney General had issued advice not to search suspected rendition planes. “We had a long discussion on issue of Gardai searching or non-searching of US military and military chartered aircraft” said Mr Horgan. “Gardai continue to insist on needing a warrant from a judge to search chartered troop carriers, and it is even suggested that international diplomatic laws forbids them from searching US military aircraft. We have never received an adequate explanation of the legal basis for such claims”. Shannonwatch asked the Oireachtas Committee to seek clarification of exactly what laws the government is referring to when it talks about sovereign immunity and chairperson Padraig MacLochlainn TD undertook to follow up on this. During the meeting Shannonwatch’s Edward Horgan noted that while legal issues such as neutrality are important, the reality that Ireland has been facilitating wars in which hundreds of thousands of innocent people including children are being killed, while failing in our constitutional and moral responsibilities to promote international peace and justice, is of greater importance. “We will not allow our government or the Gardai to ignore that fact” said Mr Horgan. Shannonwatch are organising a large demonstration at Shannon Airport on October 12th at 2pm. It is being supported by peace and anti-war groups from around Ireland, and is being held at a time of renewed bombing in the Middle East by the US and its allies. Donal O’Kelly, the creative force behind January’s Manning Truthfest, was MC for the night. Donal has helped keep the cause in the public eye in myriad ways, most recently dedicating the World’s Best Radio Show award for his play Francisco to Chelsea Manning. I was planting a tree in the garden of my north Dublin home on Saturday afternoon when the silence was shattered by a sudden thunderous roar, the like of which I had never heard before, while I caught a glimpse of a black streak flashing across the sky. My wife ran from the house alarmed and fearful – thinking that an attack of some sort was actually taking place. In our local vegetable shop, a staff member reported customers instinctively ‘running for cover’ as they were overwhelmed by the deafening noise. A man in his 70s who was repairing a house nearby had to go inside for an hour as a result of the shock. 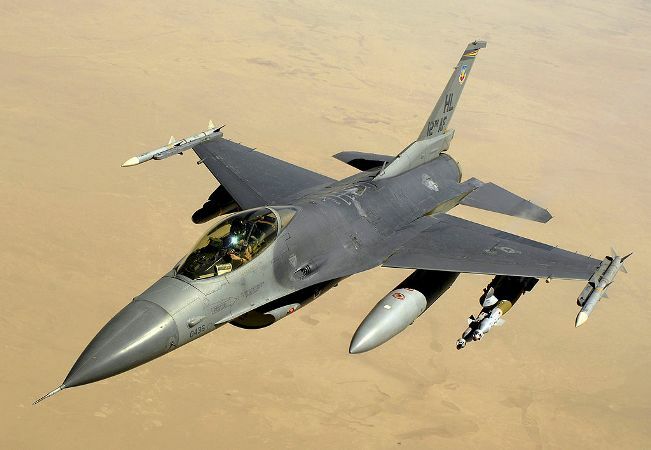 The justice and peace group Afri have expressed outrage at the “fly past” by 2 U.S. jet fighters as part of the U.S. football match in Croke Park at the weekend. 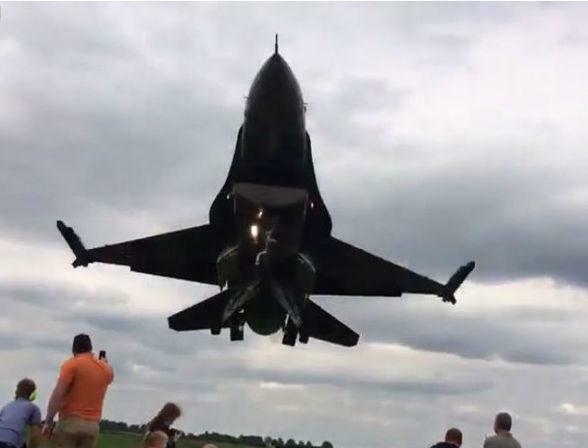 “Many people in the surrounding areas were shocked and frightened when the silence of a quiet Saturday afternoon was shattered by the thunder of 2 F16 fighter jets which, without warning or explanation, flew overhead in a “lap of honour” for the participating teams. What would it be like if, as in Iraq, Afghanistan and elsewhere, they were firing the missiles which are their stock in trade? Who gave consent for this invasion of Irish air space by elements of the U.S. war machine? Is it appropriate that the headquarters of Ireland’s national games, built over many years by the pence and shillings, cents and euros, of loyal supporters should be used as a backdrop for U.S. war propaganda? If official permission was given, Afri would condemn the authorities in Croke Park and the Irish Government for collusion with this disgraceful display. As with Shannon Airport, this shows a typically supine attitude by the Irish Government to U.S. power. Is there no limit to our willingness to prostrate ourselves before the altar of U.S. militarism? Sport should be a means of bringing people together and promoting peace, not a vehicle for promoting war and militarism,” said Dr. Iain Atack of Afri. Should there be a recurrence of this event in future years, Afri stated that it will mobilise people to protest against such obscene conflation of war and sport. Shannonwatch welcomes attempts by TDs Mick Wallace and Clare Daly to inspect US military aircraft at Shannon earlier today. At a time when the airport may be helping to supply the weapons used by Israel to kill and main civilians in Gaza, it is vitally important that we have proper oversight of what is on the military planes at the airport. Despite repeated requests, the authorities refuse to search the planes to ensure they are not in breach of international law. The justice and peace group Afri has expressed alarm at the extent to which Irish companies are involved in supplying military equipment, including to the US army. Afri first brought this issue of Irish participation in the military industry to light when it published the ‘Links’ Report in 1996, demonstrating the early stages of this trend of supplying such components. 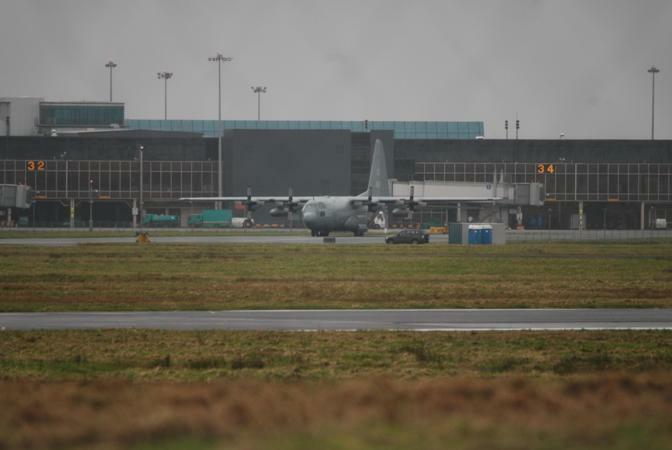 See photo attached of Hercules C 130 US warplane at Shannon today being “protected” by Irish Defence Forces patrol. In addition to its military forces in Afghanistan, US special forces are also operating in Yemen, in several African countries including Ethiopia and Somalia, and from US navy ships in the Indian Ocean, and war planes like the one photographed below are being used to transport supplies including arms through intermediaries to the rebel side in the Syrian civil war. No US military aircraft have ever been searched by Gardaí at Shannon airport, even though the Irish Government Jet on a trip to the USA with Taoiseach Bertie Ahern was reportedly searched on at least one occasion at Washington Dulles Airport. The people of Ireland are being pulled into wars we don’t support. Every week planes full of armed U.S troops pass through Ireland’s Shannon airport en route to conflict zones. The airport has been directly involved in the illegal invasions of Iraq and Afghanistan. Over two million U.S troops have used Shannon Airport since 2002. Ireland has even given an exemption to fees for these military flights. In addition, CIA rendition torture aircraft have regularly used the airport en route to the notorious Guantanamo Bay prison camp and other torture sites. Shannon’s use as vital cog in the illegal U.S. renditions programme has been highlighted by Amnesty International, the Council of Europe, the UN Committee Against Torture and others. It’s time to show the world that we don’t support the bombing, killing and torture of innocent people. With Shannon back in the news, we now have a real opportunity to put pressure on politicians to hear our voices. Please sign and share the petition today. 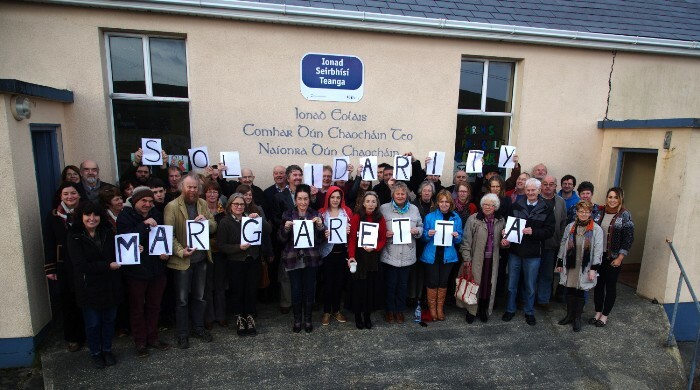 Peace activist Margaretta D’Arcy was arrested yesterday and brought to Limerick prison to serve a three month sentence. Ms D’Arcy suffers from Parkinson’s disease and is also being treated for cancer. She was arrested and charged as a consequence of a peaceful protest against the use of Shannon Airport by US troops on their way to and from their wars in Afghanistan and elsewhere, due to the Irish Governments commitment to active participation and support for the doctrine of perpetual war. She refused to sign a bond to say that she would stay out of unauthorised zones at Shannon Airport. Please contact Mr. Alan Shatter, Minister for Justice at: minister@justice.ie to seek her release and share this message with your friends. The human rights group Afri has said it is dismayed but not surprised by the revelation, given in response to a Dáil question, that a US military aircraft “armed with a fixed weapon” stopped at Shannon airport early last month. Afri opposes the use of Shannon by US military because of the way it implicates Ireland in the slaughter of tens of thousands of innocent people in the US’s disastrous wars in Iraq and Afghanistan. Afri believes, as confirmed by groups such as Shannon Watch, that weapons are regularly transported through Shannon, the only difference being that on this occasion the weapon was visible. The ongoing arrogance of the US was again in evidence in the failure by the Embassy even to answer questions about the type of aircraft or weapon where the aircraft had flown from or its destination. Afri is appalled by the craven attitude of the Irish Government and by Mr Gilmore’s bending over backwards in an embarrassing attempt to explain and excuse this ‘administrative error’. Afri once again calls on the Government to end this practice of participating in proxy war by handing our airports over to the US war machine.